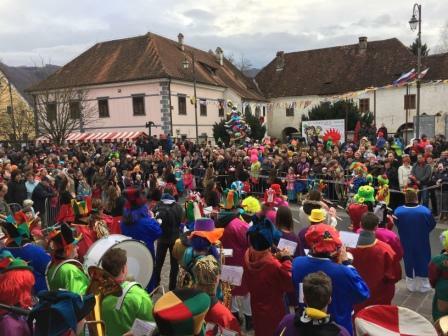 It’s a traditional carnival in Kostanjevica na Krki that started in 1854 and takes place every year around Shrove Tuesday. The word Šelmarija comes from Schelm (mocker, rascal) and the participants are all united in the assembly Prforcenhaus. The carnival, that lasts from Sunday until Wednesday, gets its name from a metal head, named Šelma. The group of “fools” impersonate a lot of roles as the father Šelma, the president of Prforcenhaus, the canon, the governor of the bank, the town lords, the guards and others. The governor of the bank announces a new currency of “chestnuts” that can be used in local bars for paying the drinks. The celebration starts Sunday morning, when the cannon salvo announces the beginning of Prforcenhaus and the local band rounds round for the reveille on the streets of Kostanjevica na Krki. In the afternoon, the Kurent’s banns and thousands of group or individual masks form a parade. Monday is the day of the general assembly, where they “wash their dirty underwear” from the past year in a funny way of all the people in the public sphere of Kostanjevica na Krki. Every year at the general assembly. They also elect a new president Prforcenhaus in the most democratic way possible (the town guards take him by force to the stage, where they crown him as the new president). It’s similar to the installing of the Carantanian dukes, who were also elected for a period of one year. The day ends with a mask dance in the bar Žolnir with the slogan “until dawn”. Tuesday morning, the board of Prforcenhaus take the bear to the town streets, they visit the school, the kindergarten and some houses. The bear rubs shoe polish on people passing by. He prefers young girls. In the afternoon, they plough and sow the streets of Kostanjevica. The children drag the plough, the ploughman and the sower behind them sprinkle the streets with ashes and seeds. In the evening, there’s the promenade concert with the brass band of Kostanjevica. On Wednesday, they organize the final event of the carnival – the Kurent’s burial. The funeral procession takes place all over the town streets, where the mourners stop in the town bars and try to quench their sadness. The procession stops at the southern bridge, where they burn the Kurent and lower him into the river Krka, while the town judge reads the Kurent’s will. He is carried away by the river, followed by the cannons shots. The day ends with a happy post burial feast. 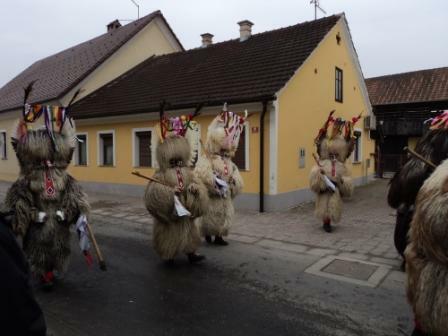 Šelmarija is one of the biggest and oldest carnivals with a rich cultural heritage in Slovenia and it is worth seeing.